Britain is no longer going RIOT CRAZY. Is this a good thing? Possibly – if it means we’re no longer subject to fight-the-power, knocked-this-up-when-I-was-drunk, quasi-protest songs like this. 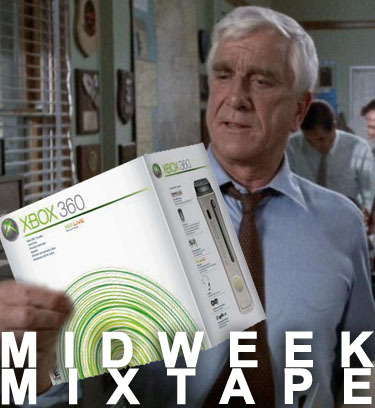 Lt. Drebin has been out all week catching perps, and is exhausted, thank you very much. He also wants to know if you want a really cheap as-new Xbox. FIRST: Sleeping In The Aviary are one of those bands that blur the ‘new band’ status, having played in a ton of other projects for about, ooh, a decade. Talking Out of Turn is a power-pop smash that will perhaps mean they can finally hang around in one band for a while. Phew. SECOND: Cid Ninja are drenched in mystery and intrigue. But hey, which new band isn’t these days? Fortunately, Soker Du has the spook-pop chops to back up just about any stance they fancy. A song of tantalising brevity and deft construction. THIRD: Ryan Jovian might know what the Black and Blue Shift is, but I, frankly have no idea. That’s my fault, of course. You can blame Ryan for making a song that is half trippy house synths, half rock clatter, and half gutsy vocals. Wait. That’s three halves. Whoah. FOURTH: Can you imagine being Robbed By Robots? It would be so awesome. You’d never talk about anything else for the rest of your life. Maxed Out sits somewhere between low-down minimal techno Super Discount-era French House music. It is not made by robots. Sadly. Posted on August 17, 2011 by Joe Sparrow. This entry was posted in Headline, Today's New Band. Bookmark the permalink.